A local history booklet by Bob Walker - available now! A5, card cover, comb-bound, 30 pages, 14 illustrations. In addition to Saltaire, the District of Bradford used to have a second model industrial village, ‘Ripley Ville’ which contained workmen’s cottages, alms houses, shops, ‘schools’, a schoolmaster’s house, a church and vicarage. The village was the idea of Henry William Ripley who was a controversial local politician and owner of the nearby Bowling Dyeworks. There is no biography of (Sir) H W Ripley (1813 – 1882) and almost all of the original Ripley Ville buildings have been knocked down. 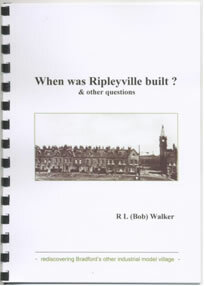 Now, in this booklet, local author Bob Walker clears up more than a century of confusion about when Ripley Ville was built and explains why this matters. It has taken more than five years of detective work. Follow the clues and weigh the evidence with the author to discover when Ripley Ville was built. This journey of discovery adds to our understanding of H W Ripley’s career, Victorian housing and land use in West Bowling and for industrial model villages in the West Riding of Yorkshire. Bob Walker lived in West Bowling for 15 years. He has published profiles and reports on ‘Greater West Bowling’, based on annual walked surveys between 1991 and 2001. This is his first booklet on the history of this part of south Bradford and on Victorian Ripley Ville. Hi All, this is very welcome news, and I'm interested to see that Ripleyville was more extensive than I had understood it to be. Ripley was a colleague/ friend of Salts (although there was controversy over election matters, in which Titus Jr kicked up the dust), but I understand that that blew over, and Salt later sent a wedding -present to Ripley's daughter. Thanks for your enthusiatic responses, the offers of help and suggestions. It would be great if you could feature the booklet on the History Club pages of the SV web-site. What you say, Dave, about the relationship between the Salts and Ripleys is very interesting. Ripley is a bit of a between-ager. Henry's father Edward was more a contemporary of Titus and worked with Titus as one of the 'alternative elite', as Jack Reynolds calls them, on Bradford Town Council. Henry, however, is both the major innovator/entrepreur in his family and a member of the second generation of this elite. Like Titus' sons he moved in the latter part of his life towards Anglicanism and the Tory party. Hence the falling out over politics. The dating of Ripley Ville is interesting because it ties in with Henry's attempts to became a Bradford M P in 1867 and in 1868, attempts that led to acrimony and a split between Bradford Liberals. The re-dating also puts Ripley Ville firmly into the category of later model industrial villages, alongside Akroydon rather than Saltaire. This means there are very interesting comparisons to be made. Thanks again for your encouragement and offers. Please add your comments to the History Club Forum.